Lygya Maya is dedicated to providing the highest quality, most fun-filled presentations packed with tools and skills for a more truly productive workplace. 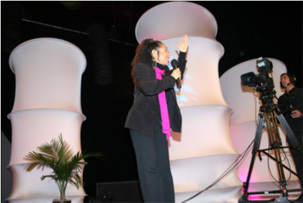 These educational, inspirational, entertaining keynote programs and seminars combine humor with the most cutting edge communication techniques. 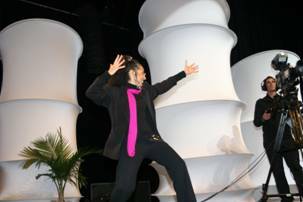 Maya is a unique Brazilian female motivational and inspirational speaker, bringing people a message of how to smarten up by lightening up to thousands of people who are high-tech, low-tech, and non-tech. With her Cheeka Cheeka BOOM formula of turning the frustrations of everyday life into great incentives for growth, Lygya demonstrates how to use humor to become more creative, more productive and stress free. Raising herself from a homeless child to a star in many communities, Maya can’t wait to share her secrets with those who will join her in a quest to make the most out of this life. She will uplift and captivate you through her inspirational and funny stories, while she passionately conveys her experiences, giving the message that no obstacle can stand in the way of a determined mind and heart in business or in your personal life. Using sense and humor to manage change with workplace issues. Learn how to change stress into success with laughter. Lygya starts planning your program based on the experience she’s gained in many diverse industries and organizations. She’ll make an in-depth interview to identify the challenges you perceive as most crucial and to focus on your desired outcomes. With more than 7 years of experience, Lygya will adapt her message to the underlying concerns, issues and obstacles facing your audience. The intuitive understanding of their daily frustrations that she demonstrates with warmth and humor will have your audience embrace her and taking her powerful message to heart. Give your audience a gift with a presentation that is personalized! Lygya wants to be known for the precision with which she customizes every presentation. The program with Lygya Maya is guaranteed to leave the audience inspired and eager to make it better professionally as well as personally. We customize presentations to fit each client’s specific needs and desires, from keynotes to staff training and project development. Our ultimate goal is to create a presentation that meets your goals and exceeds your expectations. WOW! The great job you did for our women in the Professional Women’s Day is still resounding even as I pen this THANK YOU!Your energy, joy and warmth are truly contagious! Thank you for allowing us to bask in your radiance… Women in Business and I am honoured to be associated with your happiness magnetism. When the opportunity presents I will promote your services and highlight your special touch to other organizations in Florida”. Your presentation at the NAWBO August dinner meeting was phenomenal! The 4 steps to reaching a “Cheeka Cheeka Boom” lifestyle are rules to live by to facilitate our lives for balance. We tend to get busy with our daily routines and forget how simple it really is. I want thank you for reminding us.Your high energy level is very motivating and inspiring. Continue the great work! As a president and CEO of the MPPRCC (Miramar & Pembroke Pines Regional Chamber of Commerce), I have had the pleasure of interacting with LygyaMaya. She comes with a wealth of professional experience and her presentation was very well received. Lygya’s commitment to her profession as well as her community has been faithful. She is innovative, articulate and adds great strength to any organization or effort she gets involved with.